As you've probably noticed, Guitar Center have kicked off their Black Friday and Cyber Monday activity early, with a series of offers in the lead up to the big weekend. We'll be bringing you the pick of those deals, starting, on the drum side, with this cymbal saving. Sabian's well-established HHX range is a development of the firm's HH (hand hammered) traditional approach to cymbal smithing with the added X factor of 'tone projection'. 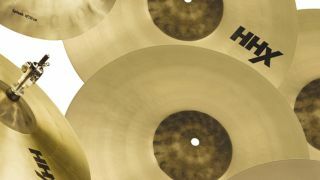 Therefore HHX cymbals are HHs with a touch of extra dirt and bite, which it sometimes refers to as 'tone texture'. This offer is valid until 21 November, and you'll need to use the code NOV15 at checkout.